A few weeks ago, the Fédération Internationale du Béton (fib) sent me the pictures from the fib Symposium in Prague which I attended. 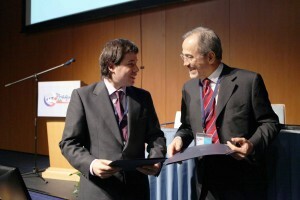 During this conference I had the enjoyable experience of receiving the 2011 fib Achievement Award for Young Engineers in the research category (see fib website). The award was given in memory of Ivar Holand an outstanding structural engineer and professor in Structural Mechanics from Norway best known as one of the pioneers of computer-based finite element method for structural analyses with significant contributions in the field of large offshore concrete structures and development of high strength concrete. The conference gathered engineers and experts on structural concrete from around 50 countries. It was nice seeing some familiar faces including members of the UK fib National group and some former colleagues. I also enjoyed talking about structural engineering and research practice to other young researchers some of them who might be applying for the award in the next couple of years. I cannot imagine a better setting for this that the lovely city of Prague which I know quite well. For all this I would like to thank fib and UK fib National group for putting my application forward, my PhD supervisor Dr. Robert Vollum (reader at Imperial College London) and sponsor Fundación Caja Madrid in Spain for helping me throughout my PhD. I would also like to thank all my colleagues at Surrey for all your emails and kind words.